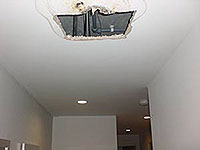 The Southfields plasterer was called to repair a ceiling in a modern apartment block as part of an insurance claim. 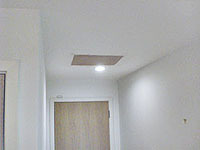 Our professional plasterer cut back the affected ceiling area & scraped off any loose plaster. As this was a suspended ceiling it was also necessary to batten out the ceiling to give a fixing for the new piece of plasterboard.